Hope everyone had a fantastic summer! I continue to work as the press secretary for Massachusetts Gov. Deval Patrick and will be teaching a political communications course again in the spring at Emerson College. I was also named to the New England Regional Board of the Anti-Defamation League. As always, I had a wonderful time playing rugby this summer at the Acton 10s tournament with 18 other Brandeis rugby alumni. We clawed our way to second place in the Bowl Division, our best showing yet! Sarah Lackritz writes, “I just graduated in May with my M.B.A. from Georgetown University (along with Ben Charon ’04). Being back on a college campus definitely made me nostalgic for my Brandeis days. Some of my friends from Georgetown and I are working together on starting up Goruck, a company that was founded by a close friend and Georgetown classmate, Jason McCarthy. We make military-inspired, high-quality, stylish gear and just generally have a good time being able to wear jeans to the office (always a personal goal of mine). We also run an endurance team event called the Goruck Challenge that is inspired by the training offered to the Army’s Special Forces. I participated in the challenge that was held in Boston in May (any excuse to get back to Brandeis).” Shoshana Bresko graduated from the University of Washington School of Pharmacy in March and is now a pharmacist at Virginia Mason Medical Center in Seattle. She married Seth Blank on July 17. Elissa Glucksman and Jay Hyne attended. Kristin Bartodziej and Mark Paige ’07, who were married in 2007, live in North Carolina. Mark is a captain in the U.S. Marine Corps and completed a combat deployment to Afghanistan in October. Kristin is a first-year veterinary student at Virginia–Maryland Regional College of Veterinary Medicine. They plan to move to northern Virginia early next year. Joshua Levine is pursuing an M.B.A. at Cornell University’s S.C. Johnson Graduate School of Management. Many Brandeis alumni attended the July 23 wedding of Aaron Hoffman and Jessica Dillon in Boston. The couple went on a honeymoon to Spain. Micah Hahn is pursuing a Ph.D. in environment and resources and population health sciences at the University of Wisconsin–Madison. She is studying the environmental determinants of Nipah virus in Bangladesh and malaria in the Amazon. She is also the program director for F.H. King Students for Sustainable Agriculture, the student farm group on campus. Donnie Phillips, M.A.’06, is going back to school for an M.B.A. at the University of Chicago’s Booth School of Business after five years in investment banking and private equity at Evercore Partners, Sun Capital Partners and MidOcean Partners. Paul Mosier graduated from the New England School of Acupuncture with a master’s in acupuncture and Oriental medicine. He plans to open a practice in southern New Hampshire. Congratulations to Rachel Goldsmith, who received a Ph.D. from the Department of Pathology and Lab Medicine in the School of Medicine at the University of North Carolina at Chapel Hill. Jessica Herman was named vice president and chief development officer for the USO in metropolitan New York. The USO works to support America’s troops and their families. Jessica had been at CCS Fundraising as an executive director and senior nonprofit management consultant. Dawn Miller is an associate at Crowell & Moring’s office in Washington, D.C. She practices in the environmental and natural resources and health-care practice groups. Dawn received a J.D. from the University of Virginia School of Law, where she won the 2010 Virginia State Bar Family Law Book Award. Martin Kaminski began postgraduate medical training as a house officer at St. Mary’s Hospital in London in August. He is working as a foundation doctor under the direction of Imperial College London and the London Deanery for the next two years. He writes, “In that time, I hope to learn how to properly pronounce ‘Leicester Square.’” Rebecca Hanus is pursuing a Ph.D. in social work with a focus in ethics. She presented a paper at a conference on aging in San Francisco in April. Lianna Levine Reisner; her husband, Elnatan ’05; and their baby daughter, Maayan, moved to Manhattan’s Upper West Side over the summer. Elnatan works in software development at Jane Street Capital, a trading company. Troy Trejo started Trejo Consulting after leaving his position in finance and business development at New York–Presbyterian Hospital. He is engaged in health-care projects on the East Coast and in South America. He hopes to reconnect with classmates working in health care and other sectors. More than 30 Brandeisians attended the wedding of Shayna Skelley ’06 and Avi Coburn ’04 on June 6, 2010, at Ocean Edge Resort in Brewster, Mass. 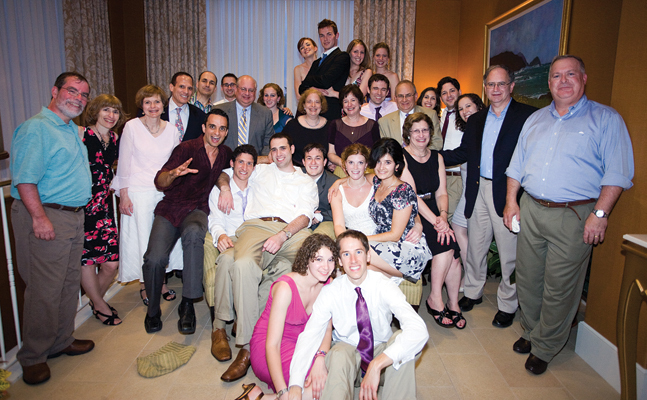 Shown (left to right): front row, Marnina Cowan ’10 and Seth Coburn ’10 (brother of the groom); sitting, Georgi Gospodinov, Ph.D.’07, Avi, Alan Berk ’04, Joshua Simmons ’06, Shayna, Veronica Peschansky ’06 and Marcia Rosenblatt Weisbrod ’75; second from back row standing, David Salomon ’75, Marilyn Leeds ’75, Marcy Millman ’75, Mitchell Lindauer ’73, David Ash ’73, P’06, Brian Coburn ’07 (brother of the groom), Jonathan Cohen ’73, Lindsey Saunders ’07 (fiancee of Brian Coburn ’07), Anne Frankel ’75, Phyllis Brenner Coburn ’75, P’04, P’07, P’10 (mother of the groom), Greg Vikingstad ’05, David Coburn ’73, P’04, P’07, P’10 (father of the groom), Rachel Ginsberg ’06, Brett Friedman ’04, Ashley Firestone ’05, Glen Weisbrod ’75 and James Kimenker ’73; and back row standing, Jenna Scherer ’06, James Yeaton ’04, Julie Chakrin ’06, Ariel Plotkin ’06. Michael Chapper ’04 and Adam Tronheim ’06 attended but are not pictured. 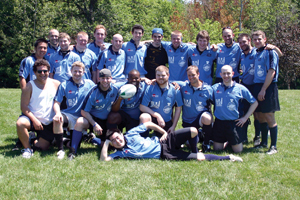 For the fourth consecutive year, a group of Brandeis alumni fielded a team in a rugby tournament in Acton, Mass. The team finished second in its division. Team members (from left): front, Youn Kim ’06; middle, Ben Rotstein ’09, Henry Schleifer ’10, Alex Goldstein ’06, Edgar Ndjatou ’06, Paul Flynn ’06, Ben Greenfield ’08 and Jason Unger ’06; back, Huy Le ’07, Brandon Arber, Stephen Robinson ’11, Brit Keithahn ’11, Alex Visciglio, Adam Greenblatt ’10, John Homans ’12, Dan Mauer ’06, Harry Shipps ’11, Jordan Goodnough ’09, Ahron Lerman ’05, Dan Tress ’07 and Jacob Bockelmann ’09. 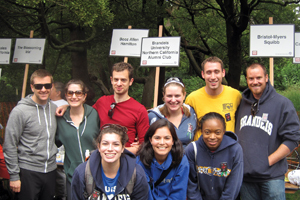 Led by club co-presidents Monica Katz-Lapides ’06 (front row, center) and Lauren Becker ’08 (front row, left), members of the Alumni Club of Northern California hit the streets of San Francisco to walk in support of AIDS research. Showing their Brandeis pride and commitment to social justice, they raised money and awareness.